Holidays. I love them. There’s nothing better that knowing work is over for a couple of weeks and you are going somewhere new to explore either with family or friends. You could even be going somewhere you’ve been a few times before safe in the knowledge that everything you want is there and you know where it is so you can put your brain away and give it a rest. To get to France from the UK, you either have to fly, use the tunnel or take a ferry. Taking the ferry offers the ability to bring the ‘odd’ bottle of wine back, hence I take the car. Brittany Ferries run various services from Portsmouth, including the overnight run to Saint Malo. 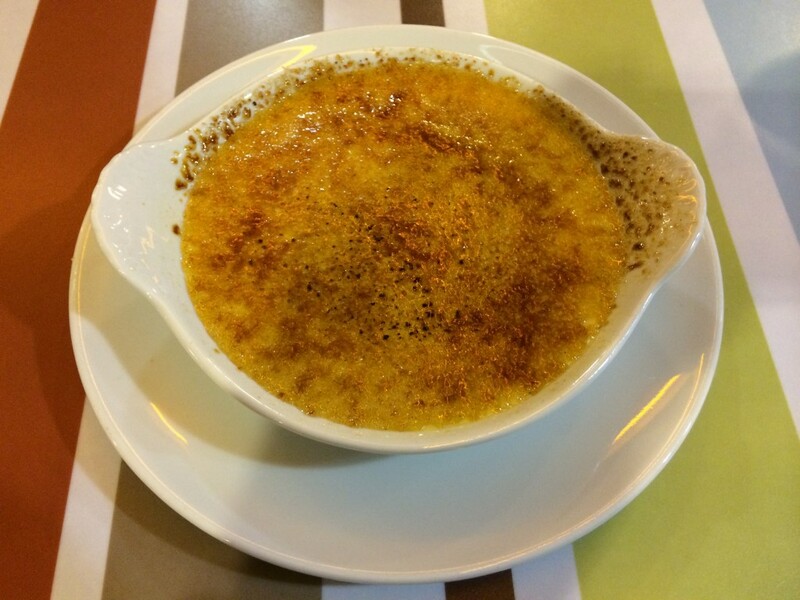 This works just fine with a young family AND it has a great selection of restaurants to choose from… And so to the brûlée. At risk of rushing ahead, tonights offering was simply superb. I had my doubts that a passenger ferry could serve up something worth writing about, but how wrong I was. Perhaps it’s because it was run by the French, therefore the lack of ‘focus’ that one might expect from a mass production environment was overcome by a piece of French culture that should never be ignored. They love to eat. The brûlée was delivered in a standard sized ramekin at room temperature, with the custard lightly flecked with vanilla pod. The sugaring was light but firm, giving only after a second tap with the spoon. The custard was very light and smooth with no curdling in sight hence was very pleasurable indeed! The secret was in it’s simplicity and I found it odd that this ‘close to perfect’ brûlée was discovered in a cross channel ferry self service restaurant some where in the middle of the English Channel on a Monday evening. I’m hoping it wasn’t a dream… An outstanding effort worthy of a solid 9/10.